Submitted by witness on Sunday, November 12, 2006. LOCATION DETAILS: Withheld at the request of the witness. OBSERVED: My son and I had met with some sasquatch investigators to show them some tracks we had found on Sept. 20 while deer and bear hunting. We all agreed that the track did not show enough detail (they were in gravel) to be conclusive but we thought they were possible sasquatch tracks. I decided to investigate a clearcut higher up the mountain to the west but it took a while to find the road which led to it. It was the beginning of the last hour before dusk when we finally reached the top of the clearcut in our truck driving slowly and glassing for deer and bear (and sasquatch). It is my strategy to combine regular hunting with looking for sasquatch sign to avoid the disappointment of not finding sasquatch sign. At a fork in the road, my son went right on foot and I drove left a short distance to a landing and looked around. He radioed about 10 minutes later to pick me up at the landing he had reached. On my way there I noticed tracks on a gravel bank sloping down to the road. They were very fresh and were about the size of my sons tracks but the way they stepped back down to the road made me curious. The last step parallel to the road was only lighly impressed as if stopped in mid-stride and then the foot swung down toward the road at right angles to the direction of travel. The footprint that would have pivoted did not seem disturbed. Because of this extraordinary agility, I speculated to myself that this was a young sasquatch who had been scolded by it's mother not to leave tracks (haha) but was pretty sure they must be my sons tracks. I decided then that I would investigate this and try to duplicate the 90 degree maneuver after picking up my son only 100m away. I picked up my son and asked if they were his tracks. He said no, they were boot tracks. I stopped anyway and looked at one of the last tracks. I was shocked when I saw a clear crescent of toes (no individual toes because of the gravel) and I realized that sasquatch does exist and we had come within minutes of having seen one. At this point I stopped thinking clearly and skipped directly to my plan to try to duplicate the last maneuver indicated by the tracks. I did not complete this before I succumbed to my sons nagging to leave. It was about noon the next day before I recalled what had happened the previous evening and by supper I new I had to get back there to take pictures and casts. Unfortunately it rained heavily all this time and by Monday noon, only one of the 14 11 inch tracks showed any of the detail that so stunned me 2 days before. I photographed the site and made a cast of the one track showing detail. On Saturday I had noticed where an animal had climbing up a bank about 20m past the tracks. This was before I realized they were sasquatch tracks and just as I spotted my son to pick him up. On Monday I noticed 2 places where animals had gone up this bank. I probably hadn't noticed the second set because I was also looking for my son. They needed to go up this bank to reach the forest. ALSO NOTICED: No sounds or smells. When we entered the clearcut I thought I saw some dark motion in the area of the tracks but by the time I got the binoculars up there was nothing. There was a sparse screen of trees between the road where we entered and where the tracks were. OTHER WITNESSES: Myself and my 14 year old son were hunting deer and bear (and sasquatch). 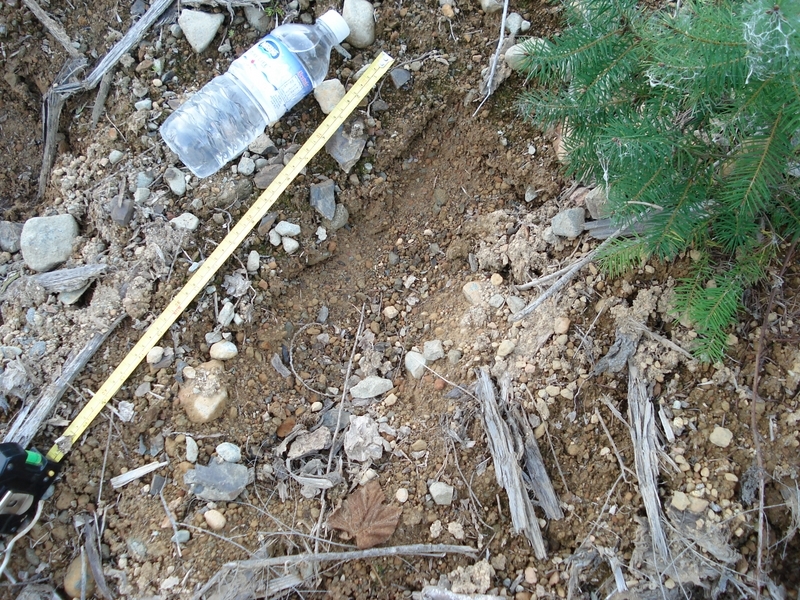 OTHER STORIES: I was shown pictures of 10" (I think) tracks found near here be a sasquatch investigator last year. Maybe the same animal. TIME AND CONDITIONS: Late afternoon, cloudy, threatening to rain. 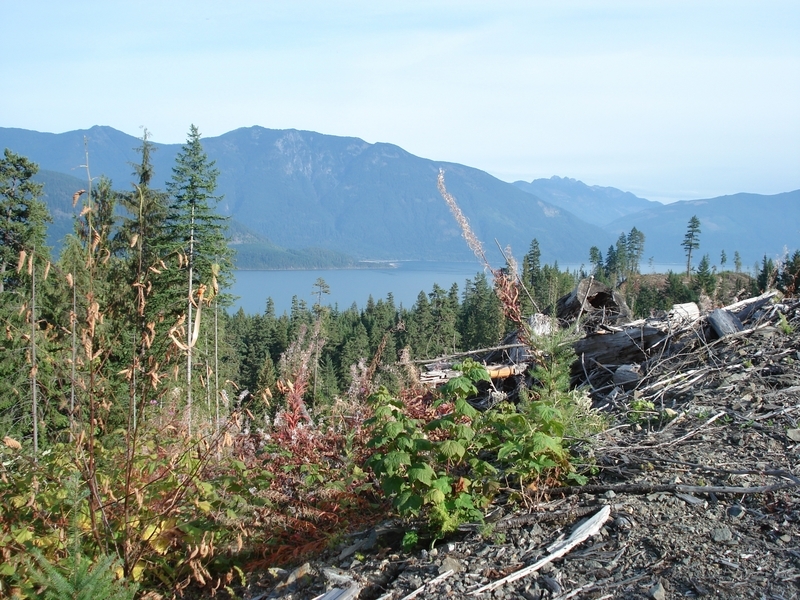 ENVIRONMENT: 3-5 year old clearcut in temperate rain forest. Steeply sloping mountainside with small streams. High rocky mountain to north. I have spoken with the witness several times over the past year and was able to visit the site with him today (Nov 2 2008). He is an experienced hunter and knows the signs of most of the animals in the area. These were not bear or deer tracks. He had found more tracks at the same location two weeks ago and two of them were still partially there. They were mostly eroded by weather but were still clearly visible with a little of the detail remaining that was apparent when he found them. The tracks that he found appeared to be coming down the sandy embankment and then going back up a few yards away. The two that were going up the embankment were the ones that I got to see and the distance between them was approximately four feet. The embankment was a little over twelve feet high on a 45 degree angle with loose dirt covering most of it. There were only two tracks going up this incline and when we went up to them to get a closer look our steps were no more than a foot apart with our feet sliding down the slope. The size of the tracks would have been approximately fourteen inches long but because of the erosion there was no detail left to see other than a general shape. The dirt in the tracks was packed quite hard and I believe that's the reason they have remained there this long. It is an area that we will be monitoring in the future.